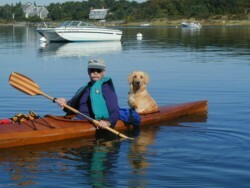 Pygmy Kayak - Coho model modified to carry dogs. Empty boat on the shore of Lake Champlain. This specially constructed kayak is built from a kit availalbe from Pygmy Boats, Inc. It is made of marine plywood and epoxy using the stitch and glue method, which is easy to follow and takes about 70 or 80 hous to complete, without any special woodworking skills or experienece. 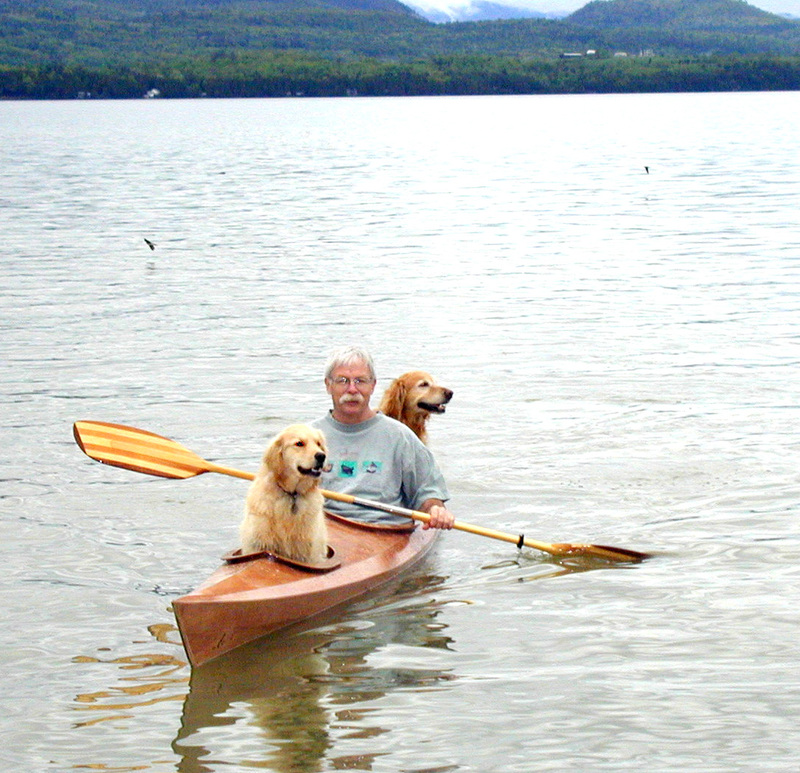 Having built two standard Cohos previously, one of which is shown below, I decided to make a third one specifically to be able to take our golden retrievers (Ginger in the front and Suzy in the rear). 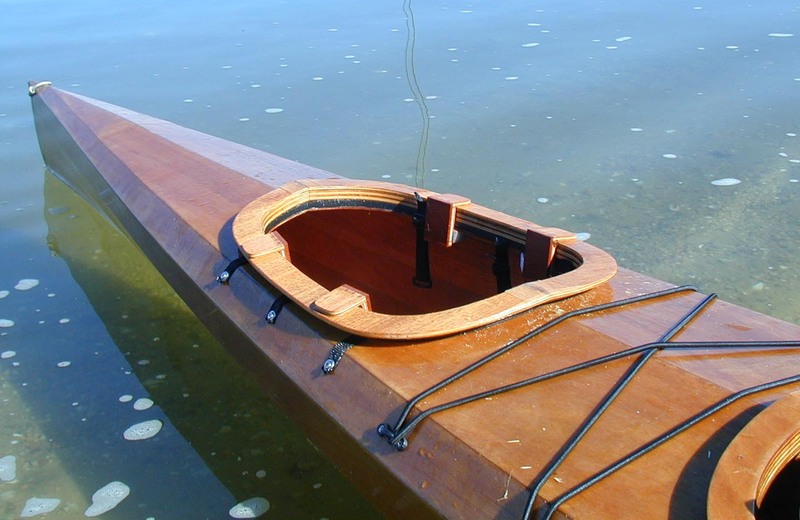 Both of them had ridden along previously and always seemed to enjoy it, but they were cramped in the small access to the storage compartment, which on the standard Coho I had to modify by making an attachable coaming to keep water from coming in. 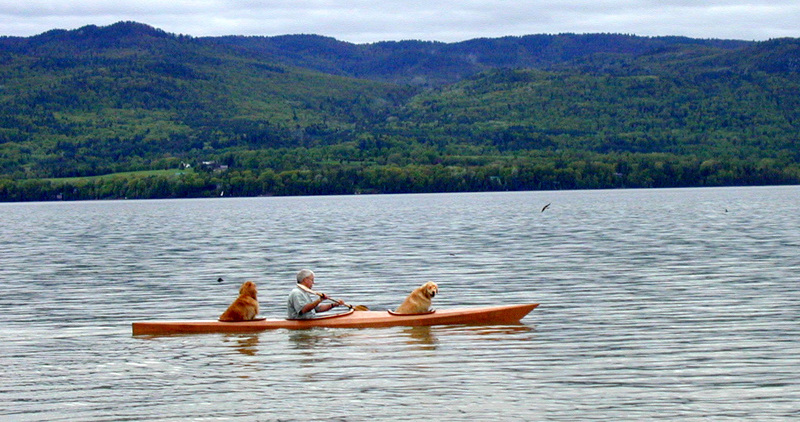 A triple kayak (the Osprey triple) is available from Pygmy but is considerably larger (in order to accommodate leg room for three humans) and requires a rudder. It is heavier and more expensive than the Coho, which weighs only about 40 pounds, so this boat seemed like the logical solution to be able to retain the handling characteristics of the Coho and the carrying capacity (for 2 dogs, at least) of the Osprey without giving up any functionality of the Coho. The modification is done by simply adding two additional cockpit coamings and a set of bulkheads in between them. 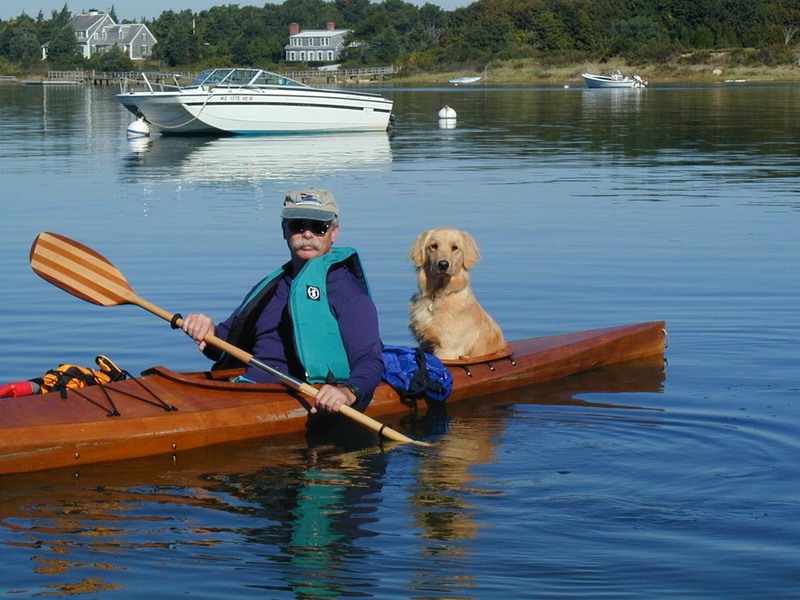 I am in the process of making a simple attachable hatch cover so that the kayak can be used just like a regular Coho but without the dogs, and I'm planning to have two sea socks made for the dog cockpits to prevent flooding of those compartments if we capsize. 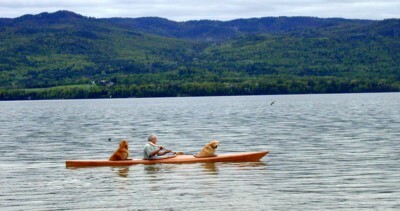 Both dogs have been trained to enter and exit the kayak on command on shore. They have gone on fairly long paddles without a problem, but these cockpits should be large enough to allow them to lie and "relax" down if they prefer. I'll be adding more pictures later. 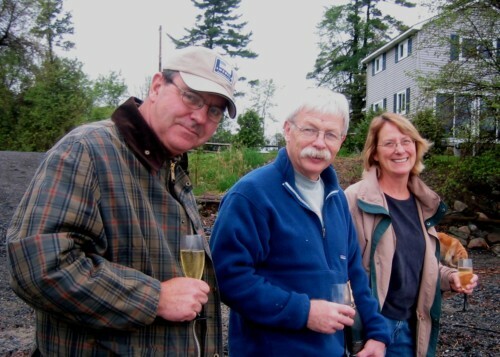 Launch day. We drank the champagne instead of breaking it on the boat. 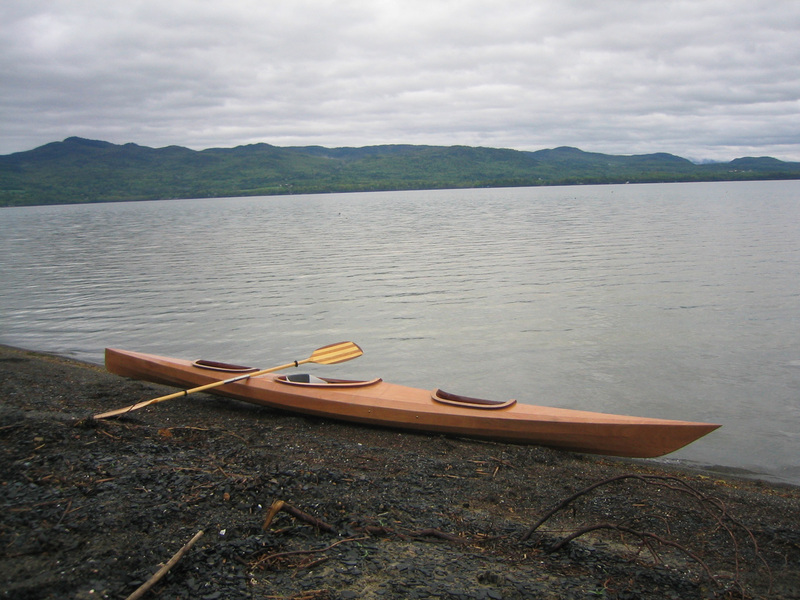 This was the original, sort of prototype, configuration of my first Coho, with Suzy sitting in the rear hatch area. 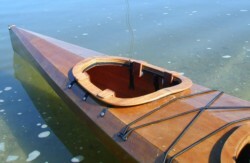 The add-on coaming was held against the foam strips for the hatch cover with home-made wooden clamps. When we got our second dog, all I did was clamp a foam "noodle" around the forward baggage area instead of building another coaming. The forward area would be too small for Ginger except as a puppy, so I decided we'd need a more permanent fix.